Beat down fists of vengeance is the latest fighter/adventure game from THQ that takes place on the fictional city of Las Sombras that no one wants to live in. This ravaged city (loosely based on Los Angeles) is run by the order of street gangs and when your leader Zanetti asks you to jump, you politely say how high. Unfortunately for Zanetti, the rival gangs are becoming far too powerful and he sends his best fighters to knock them down a peg or two but when something goes terribly wrong, you’re unfortunately on your own. Although Beat down fists of vengeance may seem like your traditional Vice City game from the screenshots, the game is actually a fighter with more attention paid to the fights then the problem solving. However with that said, the more you walk around and talk to people, the more recognized you become. Drawing attention to yourself as you try to build a gang empire under the nose of Zanetti, other bad guys and the police are bad, so you'll have to spend money on different clothes and even plastic surgery to hide out. Over time, the cycle repeats itself and the whole process of staying hidden while you grow in power gets incredibly cumbersome. Ultimately, the system discourages you from talking to people or exploring areas unless you have to, which actually helps the gamer in completing certain tasks. The five original characters in your group all have different styles – some quick movers, some brutes. You have buttons for punch, kick, grapple and block. 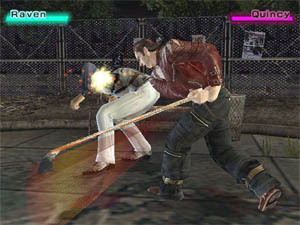 Tapping a strike quickly results in different combos, and other buttons can be used to throw or disarm. The weapons do a lot of damage when you get one, and as you progress you'll learn new combos. In random fights, you'll fight alone and can choose to slap people around for information or just take their stuff. But most of them have no information worth getting. 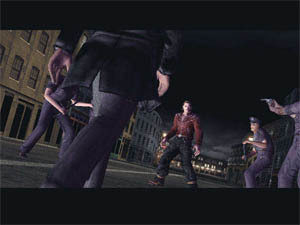 The fights that move the story along are also one-on-one, while random street battles involve groups – your people against theirs. Your cronies are about as intelligent as you'd expect – not very – but they take up enough space to let you do most of the work without getting piled on. For the planned battles, you'll have a particular goal, like getting information from the person or just beating them down. Graphically, the colour palette of Beat down fists of vengeance is extremely dark which ironically fits the genre of the title. With that said, the character models are rather well detailed which feature different tattoos, body shapes and hairstyle to help give the game that real street fighter feel. The game also maintains a respectable frame fate and match that with a few special effects and lighting effects and you have a fairly decent looking game. As with the graphics, the soundtrack of the title features a traditional ghetto sound to it and match that with all the sounds of the streets and you have one kick *** sounding game. 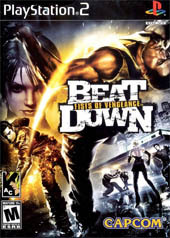 In conclusion, Beat down fists of vengeance tries valiantly to take itself as a serious adventure game (similar to the Vice City series) but unfortunately it lacks many of the aspects of the adventure genre but if you’re looking for an interesting fighter, than you might want to check this game out because it’s almost a blast from the past that is extremely reminiscent of the double dragon series.